It is said that all living things radiate an ethereal form of energy, the essence of life. Not only is it said, but it is also proven. 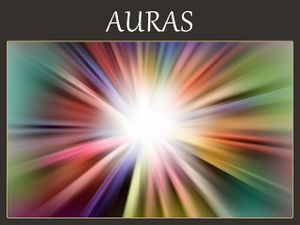 There are many types of auras each with different implications for their sources. Different auras reflect different wavelengths of light enabling an observer to infer the type of aura they can see. Heroes are dull creatures. We all know this. By default they therefore emit useless grey auras which afford them no special advantage. Unfortunately, very few living things can perceive the magical aura so nobody much notices the miserable lines of flux surrounding one of those particularly dreary souls. More colourful auras are temporary but allow the hero privileges depending on the type of aura. A hero may only have one aura at a time. If another aura is activated, it will replace the one in effect. And on very rare occasions, Monsters can place auras upon a hero. See Category:Auras or the navbox below, for a list of all auras with a Godwiki article.